Accurate Portrayal of a Hospice Nurse? I have watched it 10 or times before writing up this post. And my thoughts on it have changed the more I watch it. What is fascinating to me is the potential schism created among hospice supporters. What is driving the varied views is really an optical illusion. As you watch this ad your mind fills in the blanks based on your own experiences. On one hand a caring relationship between nurse and patient is portrayed with a focus on life review and traditions. To some people it might seem the nurses words heal in that Berta might be given hope that she is not dying tonight. Maybe Berta shared stories of regret she had not mended fences and was hopeful at an opportunity in the near future to do so. In this situation the nurse's words give hope Berta will still have time to fulfill her last tasks. But if you identify with being a hospice apologist, always having to defend hospice and dispel myths, then you might get a bit upset with this video because it reinforces the classic Western medical view of death as a defeat of the human spirit and vitality. Some have commented on the video noting that by closing the window the nurse is 'trapping the soul' of the patient, which is getting a bit absurd since the patient is clearly not actively dying. 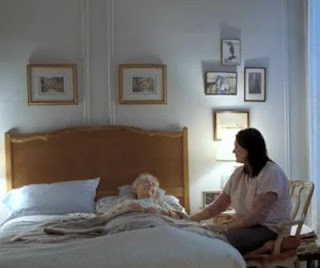 There is a place where saying "Not tonight Berta" works but I think the better reply for any hospice clinician is one grounded in curiosity: about the tradition, about Berta's feelings, about her understanding of her current prognosis, and about her hopes and fears. While it makes for a great clinical visit, it makes for lousy TV, especially in figuring out how to portray all of the above in less than 30 seconds. Overall I don't think the PSA reinforces any particular hospice myth/stigma. The piece is merely a quick glimpse of hospice nursing, focused on relationship building between nurse and patient. With the tone of the PSA being positive and supportive, I think for many in the general public (and the target audience of future nurses) this clip helps combat public concerns that hospice staff only want to get people ready for dying. In hospice there is a strong focus on living in the present which is reinforced here. For more commentary, you may be interested in the strong critique of the video at "Truth About Nursing." I'm still looking for any media source with a good honest portrayal of hospice nursing. If you know of one, please share. And don't forget to encourage hospice nurses to submit their stories.